75229 Death Star Escape is a Star Wars set released in 2019. 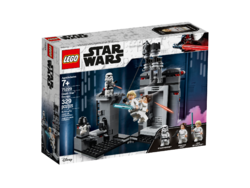 Includes 3 minifigures: Luke Skywalker, Princess Leia and a Stormtrooper, plus a Mouse Droid LEGO® figure. 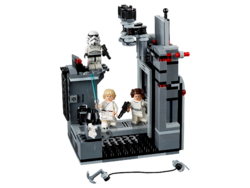 Features a hinged Death Star setting with entrance, lever-activated closing door, retracting walkway, and a pillar section with platform, access ladder, hidden Mouse Droid, an opening box with a pair of electrobinoculars, and a function to send the Stormtrooper toppling off the tower. Weapons include Luke's Lightsaber and 2 blasters. Building toy construction set also includes Luke's grappling hook. Replay the unforgettable escape scene from Star Wars™: A New Hope or make up your own exciting creative play scenarios! Death Star scene building toy (folded out) measures over 5” (15cm) high, 6” (16cm) wide and 3” (8cm) deep. Facts about "75229 Death Star Escape"